Microsoft is making availble to select OEMs and system builders a kit to allow them to “silently” preinstall Skype on new PCs. The new Skype OEM Preinstallation Kit (OPK) — about which I first learned from a post by blogger Steven Bink on May 29 — is for Windows 7. It includes the Skype 5.8 for Windows code. 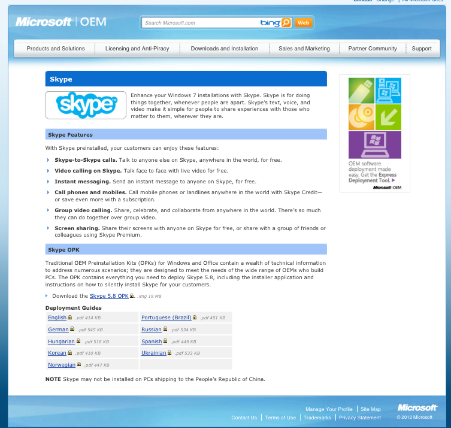 (The latest currently available downloadable version for Windows is Skype 5.9.) Skype has supported Windows 8 test builds since the fall of 2011 with version 5.5, but the new OPK is focused on Windows 7, presumably because that’s the version of Windows PC makers are shipping now. The new Skype OPK includes the installer application and “instructions on how to silently install Skype for your customers,” according to the download page. It was just about a year ago that Microsoft bought Skype for $8.5 billion. Regulatory approval of the deal closed in the fall of 2011. Microsoft is working on integrating Skype across its various business and consumer products, into everything from Office to Xbox. So far, however, Redmond has yet to make available the bulk of the promised deliverables. Earlier this year, Microsoft rolled out its first version of Skype for Windows Phone, an offering which has been criticized as being less functional than Skype for iOS and Android. Microsoft is expected to introduce an improved version of Skype for Windows Phone 8 later this year. The head of Microsoft’s Skype division, President Tony Bates, is set to address attendees of theAllThingsD D10 conference this week. As the Microsoft OPK download page notes, traditional OPKs from Microsoft for both Windows and Office are aimed at all kinds of OEMs who build PCs. They require registration before download. “System builders who distribute Windows software on a fully assembled PC can preinstall the software on the PC’s hard drive using the OEM Preinstallation Kit (OPK). The OPK is a set of tools and documentation that helps automate this process,” Microsoft explains on its OPK page for OEMs. Deployment guides for the Skype OPK are available in English, German, Hungarian, Korean, Norwegian, Brazilian Portuguese, Russian, Spanish and Ukrainian. The page notes that Skype may not be preinstalled on PCs shipping to the People’s Republic of China.